Use any existing monitor, TV, camcorder or VCR that you already have. Simply plug the RCA cable into Video Input. Mounts easily to any boathook or pole, and operates on 12 volts DC (110 AC with adapter). From running gear and hull inspections... to checking anchor set... exploring wrecks.. 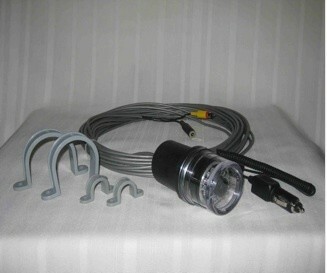 Fishing in lakes or diving.. Great for swimming pools, boats, docks, aquariums and ponds.